New Year’s Review of New 52: Geoff John’s Aquaman! This past summer, Political Jesus got SOAKED with a wave of posts ( so many puns!) relating Aquman New 52 and environmental justice! I mainly did topics relating to black American slave perceptions of nature and the physical environment and its suprising, if even a bit elusive, connection to Arthur Curry’s (Aquaman!) own experience as the King of Atlantis. After having gone through the first 3 volumes (Vol. #0,#1, and #2) I would like to say that all-in-all, I ADORED the comics. I am very much happy with this attempt at blowing new life into a superhero that rarely gets taken seriously to begin with! From the updated cosmetic art-style to the deep , profound story-line and development of Aquaman’s back-story, I became enamored from the first pages of Vol #0! Vol # 0: As mentioned, Aquaman was given an edgy storyline with depth. We’re introduced to the fact that the often-mocked superhero, harbors a deep sadness for his father as he’s looking through the pages old photo albums with his red-headed aqua-vixen girlfriend, Mera. It is revealed that his father, who was once keeper of the lighthouse , was swept away by creatures , never to return again. What’s more? Arthur is supposed to inherit the thrown of Atlantis- the epicenter, the political capital of this strange, cold, dark, underworld! While I may have used this fact as an axiom for how black American slaves felt in during slave-holding America, these plot details , even this early in the series, provide a fascinating juxtaposition of a king who has come to reign over a region ( the oceanic depths) that doesn’t receive him. His rejection by the citizens of Atlantis and the ocean at large (the aquatic creatures) is evident through Curry’s father’s death at the hands of the ocean and one of the opening scenes where our hero is swimming through the ocean and narrowly misses an angry shark swipe, hungry for blood! Excellent, excellent plot set-up in Vol. #0! Vol. # 1: More lovey-dovey between Aquman and his femme fatale – but one thing I can say ( and perhaps I’m speaking too soon…) is that there is no excrutiating display of affection between the two. I’m not one for sappy love stories so if that’s youas well then Vo. #1 shouldn’t make you wanna vomit or anything. Without giving away too much of the developing plot, the most memorable scene in Vol. #1 was Aquman at a seafood restaurant! A wiseguy cracks a joke about Aquaman ordering fish, although he “talks” to fish… there are also a few stabs at his relative mediocrity to other D.C. universe heroes (#hatersgonnahate! )… being a sucker for breaking the fourth wall, I found this amusing! Vol. #1’s pace was a bit slower than #0 yet still ended on a cliff-hanger, not forgetting the main plot! Vol. #2: Definitely the most high-throttle point in the plot of the three I’ve read! Vol. #1 was definitely the calm before the storm! The foreshadowed , anthropogenic gremlins of the deep “rise to the surface” of the plot! (ha!) Excellent action shots featuring the combative prowess of Mera and Aquaman as they try and fend of the creatures of the trench that were proving too powerful for law enforcement. Little does Curry know…these creatures are coming for their king… Staying true to the first two issues, Vol. #2 also ends on quite the cliff hanger! So far, I would give Aquaman New 52 a stunning 4.5/5 stars!! It features moments of exhilirating action, a captivating storyline rendering Aquaman respect in the D.C. universe and fascinating implications for the environment, politics, and even religion. Perhaps I’ll read the next 3 and do yet another review! Also, if we learned anything this Summer from this update for Aquaman…. This entry was posted in Political Jesus and tagged aquaman, Blerd, books, DC Comics, Geek, Geoff Johns, New 52 on January 5, 2014 by Harry Samuels. Check out part 1: Green Lantern. Check out part 2: Captain America.Check out part 3: Wolverine. Check out part 4: Power Girl. 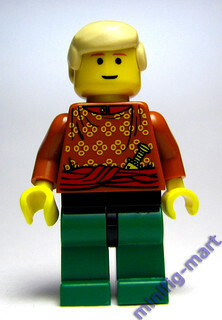 Aquaman is fairly well known to most people, even if he tends to be somewhat a joke for many. While his power level and overall skill sets are mightily impressive, the land-based bias that we air-breathers have prevents many people from taking Aquaman seriously, and lots of folk typecast him in the role of the fish out of water (see what I did there). Raised by a father who ran a lighthouse, Arthur Curry always knew he was different, but didn’t always know how or why. The ultimate reason was that his mother was an Atlantean princess and his father was a human, which made Arthur a rare half-breed, but also ultimately, the heir of the underwater Throne. His abilities manifested themselves most strongly when he was in water, and eventually, he joined the Justice League of America as a founding member. This entry was posted in Political Jesus and tagged aquaman, Blerd, books, DC Comics, Geek on November 2, 2013 by Optimistic Chad. Aquaman Vol. #2 – The Trench, Oceanography, and Theology – Ode to #Sharkweek! In Vol. #2 of Geoff John’s New 52 Aquaman , we see our hero getting more and more intimate with his sea maiden – Mera. As Arthur digs deeper and deeper into his albums of shots with his dad and other shady characters , Mera’s curiosity heightens more and more. While this is all happening, however, there is a whole legion (that we saw at the end of the last volume) of blood-sucking, alien-like monsters emanating from the deep, dark trench! Back ashore, while Arthur and Mera are oogling over pictures, they hear a swift knock on the door. It’s a police officer to alert him of the imminent danger of these gruesome trench creatures as their advancing front moves upon shore. There’s a massive scene involving the entirety of constables as they gaze out into the blackness of the night and the oceanic depths. 1. The ocean is INFINITESIMALLY DEEP! 4. Scientists estimate that up to 80% of all living things live in the ocean! 5. No sunlight = no plants, which = nearly everything these preying on FLESH! 6. There are vents shooting out boiling-hot water with sulfuric acid – would take your face clean off of your skull! 7. WE’VE ONLY EXPLORED LESS THAN 5 % of THE OCEAN! Good googly-moogly – how could God have wrought such terrifying creation!?! Well, beauty is in the eye of the beholder, for sure… but as bad and hellacious as the oceans seem, I believe the most terrifying showcase of creation is right on dry land – and even looks a bit like you and I! Earlier this week, GreenPeace had shared an image on facebook ( that I in turned shared) that seemed to really resonate with quite a bit of people. John 16:33 ” I have said these things to you, that in me you may have peace. When we look at the horrifying images of the deep sea and all the seemingly unknown, there’s a sense of queeziness that might come over us simply because it’s all so unfamiliar – did Jesus really overcome ALL the world? One of the most interesting questions I have been asked is “Do animals have a religion?” – was there, in fact, an Incarnation not only for humanity but for sharks, dolphins, and deer? It’s a little hilarious to entertain such a thought, but I believe that the above passage kind of answers the question – because Christ came to reconcile MANKIND, He OVERCAME the world! As vicious as the natural world seems, mankind’s evil is unmatched. What’s most interesting about that assertion, especially in view of the Greenpeace graphic, is that environmentalism (even the most atheistic brand) affirms this – MAN is to blame! Sure grizzlies will sever your appendages and pythons may strangle- but it isn’t the savagery of the animal kingdom that the narrative of contemporary environmentalism is so concerned with – it is the savagery of man! Environmentalism is concerned, ultimately with man’s ego and finding ways to reconcile it for the sake of ecological welfare. 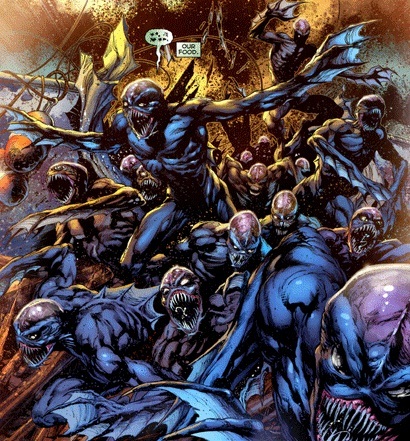 We can say, then, that maybe the scariest thing about the alien-like creatures from the trench of Aquaman isn’t so much that they represent our fear of ocean creatures ( though the artist did a good job making them look plenty gruesome – and they DO seem to operate like deep-sea leeches) – but because they’re anthropomorphic – in a way , we see the worst side of humanity in them! This entry was posted in Political Jesus and tagged aquaman, Blerd, DC Comics, Geek, Geoff Johns, Gospel of John, theology on August 9, 2013 by Harry Samuels.